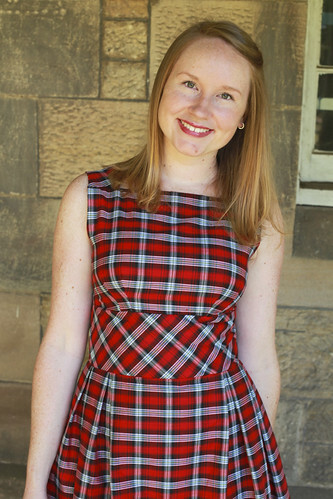 Hey, I made a plaid dress! More pictures are on my blog. I worked on this dress in stops and starts for a few weeks towards the end of last year. I love plaid/tartan but completely understand why I don’t often sew with it – it makes me mad. Getting everthing to match and line up is time consuming and, let’s be honest, a real pain in the bum! It also doesn’t help when the plaid I’m using is rectangular as opposed to square, but that’s what you get when using fabric from your stash that you thrifted years ago for about $4. You can’t have it all. I have to admit though, that despite the time consuming nature of the fabric, I am quite chuffed with how it turned out. Especially where the shoulder straps line up with the bodice. I think it’s also a lovely detail the way the plaid in the straps is angled before coming into a nice matching line down the bodice front. I got the back to line up! Yay! I’m not as pleased with the bias waist band though and really should have tried harder to make sure I started with the point of a rectangle in the centre top as opposed to the middle of one. I didn’t really have enough fabric to recut the waist band but the print itself, luckily, is busy enough to compensate for that. You live and learn. Overall I really liked the pattern. I was worried about the bodice fabric bulging out the side of my arm pit because there are no side bust darts in this dress, but it sits really nicely. 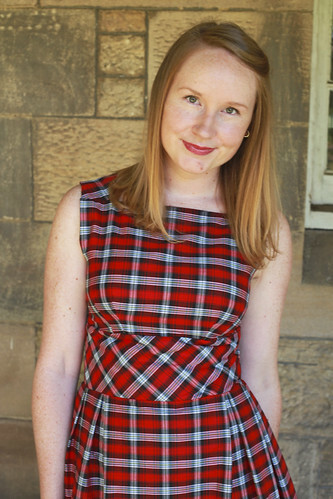 The bodice is fully lined with the same plaid fabric and the waist band is underlined with a plain white cotton (which I highly recommend if you are cutting this on the bias – gives the fabric more stability. Overall I really love this dress. I wish I could have made the skirt a bit fuller but there just wasn’t enough fabric, I added as many pleats in the skirt as I could! I think it’s going to be a great transitional piece as we head into autumn this year, and it works well as a summer dress that’s more work appropriate. I can now tick number 3 off my sewing list. 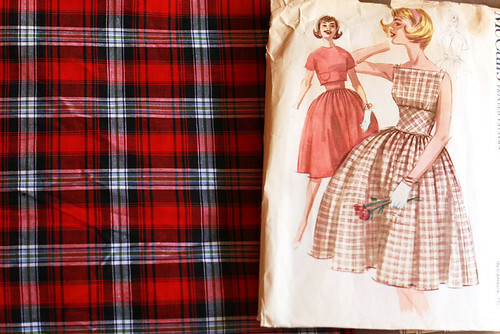 Do you use plaids in your sewing often? I’d love to hear any tips you have for making it less ‘a pain in the bum’ if you have them! Gorgeous, gorgeous job! Don’t give a second thought to how the plaid sits on the waistband. I wouldn’t have noticed had you not pointed it out. Aww, thanks Jeanne Marie. I think, as with all perfectionists, no body would notice any mistakes if we didn’t point them out 🙂 Second lesson learnt!! Wow. That is sew beautiful. A real eye catcher & the pattern is really cute. One of my pet peeves is plaids, checks & stripes that don’t match up on purchased garments, but it is an arduous task to get them all right when you are cutting. Good work, I think it looks brilliant. Thanks so much for your comment Jayne. Matching does take so much time, and it can be so frustrating when it doesn’t go as planned. I love your dress! Don’t be too hard on yourself, if you didn’t tell I would not have seen it! I do love plaid/tartan fabrics too but I can totally obsess about matching everything so I don’t use it that often. Hi Anthea, I’m the same with plaids. I tend to avoid them if I can because it’s so time consuming trying to match them. But it’s nice, having spent all that time on the dress, that it’s one I’ll get lots of wear out of! This is really nice! Very jealous of your matching skills! I love that pattern, especially that cut jacket that goes with it. Are you going to give that a go? Thanks Ange, I’m really looking forward to autumn with all of this horrible heat we’ve had lately. It reached 41 degrees in Sydney last week *cry*. This is an absolutely stunning execution of this pattern. 🙂 Congrats! I think you did a great job on matching the plaids and making it symmetrical! This is lovely and, as someone else above has mentioned, I’d never have noticed the thing about the waistband if you hadn’t mentioned it. And even now that you have mentioned it, I still don’t see it as a problem! I really like how the pleats came out in the skirt. Did you use a pattern or just wing it? Gorgeous! Your use of plaid is stunning! Very nice! Anyone who can match plaids half as well as you just did gets my respect! It looks wonderful on you. You did a great job. So beautiful! I didn’t notice your waistband mess up and I refuse to look. I love this dress! What a great job! The only stripe matching tip I have is use double sided fusible tape to line up the plaids before you sew. Just learned this when working with knits but if you were working with a fiddly woven I think it would work too. I think it looks great. I’ve maid a plaid/tartan skirt before and didn’t even think about matching up the pattern and it turned out ok naturally. Planning to make another skirt this time differenct cut but still won’t worry about matching. the best way is not to obsess over it and just go witht he flow. beautiful Lauren, what are the details of the pattern number?